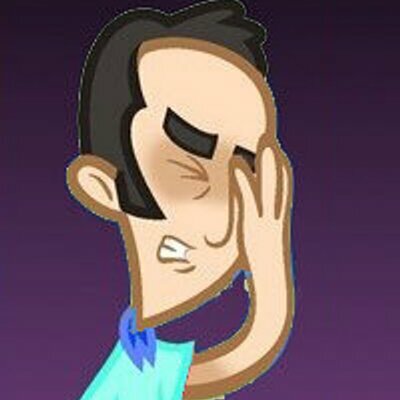 Because You Vaguely Approved Of It: More Capsule Reviews From Matt! - Wait, What? Because You Vaguely Approved Of It: More Capsule Reviews From Matt! Soooooooo … should I shut up and do some reviews, or keep babbling about this? Well, there’s only one of me, and “just listen” wasn’t one of the options, but … reviews — including Cyborg #1 — after the jump. So I felt like Cyborg #1 was two disparate halves jammed together: one thread is the eponymous Cyborg, Vic Stone, exploring some recent changes to his powers and bickering with his scientist father; the other is set “somewhere in another galaxy” where a bunch of creepy aliens are killing a bunch of “Tekbreakers”. The two threads are mashed together somewhat awardly, like they haven’t yet best figured out how to interact, and I can’t decide if that’s a clever structural meta-representation of the book’s theme, or if the creative team has just found its feet quicker on one side of the book. I suspect that it’s the latter (as much as I keep trying to believe otherwise), but the surprising thing to me is which side was stronger. I tend to think of Ivan Reis as a strong, above-average superhero artist, good at keeping large-scale action books pitched somewhere between the calmer element of DC’s house style (say, older Jason Fabok work) and the scratchy bombast of modern Jim Lee. But he’s at his best here in the quieter scenes (or, at least, the ones where the action is closer to melodrama than to violence) — Cyborg describing his changing cyborginess to his aloof father, or engaging with protesters outside S.T.A.R. Labs. I was having genuine trouble following the “another galaxy” scenes, meanwhile — there appears to be an army of enhanced human soldiers allied with some smaller alien dudes, and then an attacking army of different, Giger-esque aliens slaughtering them, but the Giger-esque aliens speak in two different languages in two differently-colored word balloons and the whole thing just kinda wound up being more of a slog to suss out than I think was intended. Writer David F. Walker seems similarly more at ease with the Earth-bound scenes — the characters there feel like believable, interesting human beings, and he’s found an interesting element of Cyborg’s powers and existence to explore. But the galaxy-far-away stuff is further muddled by some leaden dialogue. (“Time to die, Technosapien scum!” “No, Tekbreaker … you will die.” “It’s a good day to die.” and other stuff like that.) For a book that does such a good job getting me to care about a character I’ve always been largely indifferent to, the introduction and depiction of these warring factions leaves me pretty cold. The good definitely outweighs the bad; Walker’s chops in the Earthside stuff are strong enough that I’m sure he’ll get the other elements in line soon enough. Plus I’m excited to see DC team a new(ish) writer and a character who’s never held down his own series with one of their top artists. Not a flawless debut, but definitely one worth watching. Speaking of books that appear to be elaborate metacommentaries on themselves, the truly bizarre Bloodstrike #1, written and drawn by Rob Liefeld, is … it’s something else, man. First of all, it’s Liefeld apparently trying to do Mark Millar or Garth Ennis — lots of gratuitous swearing, ultraviolence, body horror, problematic misogyny — and applying his usual Liefeldian touch to the whole thing. But it also feels like Liefeld is maybe deliberately poking fun at his own notorious tics? The lead, a Deadpool lookalike, begins the book with his feet off-panel … because they’ve been chopped off. He’s suspended from the ceiling and elects to escape by gnawing his own arm off at the shoulder … in a way that is only possible if his anatomy makes no sense whatsoever. Hell, even the flat crotch of Liefeld characters is an overt plot point in this one. Even if Liefeld is doing this deliberately, though, it’s still a seriously weird book, plotwise and tonally. I mean … there’s a Cable analogue, and a Lobo analogue who graphically murders and beheads two naked women, and a character named Bella (like the Twilight lead!) who carries a bow (like Katniss! ), albeit in a weird, not-physically-possible way, and … look, this is what it comes down to: if you have been waiting since the formation of Image Comics to see Rob Liefeld’s unchecked id laid bare, your moment has finally arrived. Prez #2, like issue #1 before it, definitely earns nostalgia points from me. But not nostalgia for the old Prez series, which I’ve never read, nor Prez the character, whom I’ve only encountered in that issue of Sandman. No, what this book bringss most clearly to mind is Transmetropolitan, and especially the early issues of that series, with their more light-hearted explorations of that particular City in that particular future. Prez isn’t nearly as assured as Transmet was, nor is it nearly as biting, but there’s definitely a similar manic tone, and excited-but-terrified view of the future. Transmet aside, Prez is an amiable, pleasant-enough confection of a book, and every time it threatens to bog down writer Mark Russell throws in something like Carl the End-Of-Life Bear (above) to keep it moving along. Two issues in, I thought my biggest complaint with this book would be the Ultimate Spider-Man style pacing — we know she becomes president, because that’s the entire high concept; let’s just get there already! — but Russell and Caldwell have made the journey enjoyable enough that I’m finding I don’t mind at all. Plus, until his inevitable Alex Ross-drawn spinoff graphic novel, this is the only place for me to get my Carl the End-Of-Life Bear fix. I’d stick around just for that. Despite my lunatic ravings about Carl the End-Of-Life Bear above, I tend to be left cold by comics that over-rely on obvious memebait for their cachet. The ones where reviewers say things like “Look, it’s got soccer-playing pandas that are also pirate ninjas — what more do you need to know?? !” Usually I find myself needing quite a bit more than even the cutest soccer-playing pirate ninja panda can offer, and I feel sad and let down and not in touch with modern humanity, and then I cry. So by all rights I should haaaaaaaaaaaaaaaaaaaaaaaaaate Weirdworld #2, a book that opens with Arkon the barbarian trapped in underwater prison by a bunch of mer-apes, goes on to feature the not-so-triumphant return of a 1980’s Marvel toy tie-in property, and also has a dragon belch ogre parts all over a sorceress. Plus it’s one of the eleventy trillion Secret Wars crossovers, which is … let’s say not exactly a positive, in my book. But Jason Aaron writes it with such reckless glee, moving the story at such a breakneck pace, and Mike Del Mundo draws it in a van-art-from-Heaven style and then colors it (with Marco D’Alfonso) in the most lurid hues available, that the net result is a thrillingly fun pop comic. The only way it could be better is if I found a full run of the series on a coffee table in my buddy’s dorm room after a long night of drinking and read them instead of falling asleep. Or, put another way: it’s like Thundarr meets Planet of the Apes in Waterworld! What more do you need to know??!? 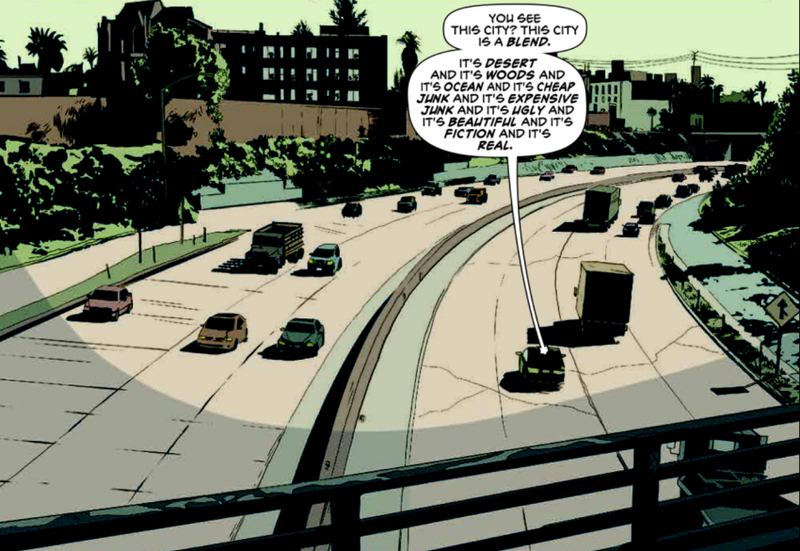 And then there’s Wolf #1, the new Image book from Ales Kot, with art by Matt Taylor and colors from Lee Loughridge. This was a book that I started out pretty lukewarm on. The supernatural-detective-in-L.A. plot was feeling worn thin, like an imaginary 1990’s Vertigo comic adaptation of HBO’s True Detective — and that was before the extended monologue over an establishing shot of an L.A. freeway. I suppose I should fess up and mention that from the second half of season 1 on, True Detective has largely felt inert to me, and I’ve already abandoned season 2. The overwrought, freshman-year-fiction-workshop dialogue; the paraphrased Invisibles lines passing as philosophy … being reminded of True Detective is not a positive for me. Kot, like True Detective writer Nic Pizzolatto, is an auteurist wunderkind, and I found myself wondering if maybe this was going to be a piece of his work that would similarly leave me cold. And then, halfway through, he introduces Freddy Chtonic, squid-faced slacker, and suddenly the whole book turns into some lively, next-level stuff. The drearier, more familiar elements fall away, and the book starts feeling much less like some forgotten Vertigo series and much more like something brand new created by people who have already read and digested the Vertigo stuff. Taylor’s artwork doesn’t hurt either — clean, Michael Lark-esque stuff that suits the L.A. noir side of the book, with more than enough chops to pull of the squid-faced dude and other assorted weirdness. Once supernatural troubleshooter Antoine Wolfe (the titular Wolf, I guess) and Freddy Chtonic are making their way through an Underworld-Unleashed- fifth-color-green hallway to negotiate with Freddy’s vampire landlords, the book is cruising along on its own momentum, more than enough to carry it through a weird narrative jump (a full-page caption promises we’ll get back to that) and a plot-twisting ending coda. In the end, the only pity for Freddy Chtonic is that he debuted the same week as Carl the End-Of-Life-Bear, and so will never be truly appreciated for saving the book the way he did. It’s a sad, axiomatic truth of life that robotic euthanasia bears trump squid-guys in hoodies every time. Matt vs. Capsule Reviews! And Only One Will Walk Away! Thanks for the heads-up on a new Ales Kot book (hi, Ales). Cyborg #1 was… at my least generous feels towards it, I was thinking “yeah, this is just the leftover whiteboard notes from whassisname’s New 52 Justice League, right?” It reads like an outline: Vic + Dad = conflict, mystery of Vic’s armor = mystery in space-at-this-moment-but-soon-appearing-near-you. I kind of liked the idea that there’s only one door to STAR Labs, and that one of the objects of the protest would just walk out, say, “hey, how you guys doing?”, and keep going. It’s almost surreal and self-aware in a Numberwang kind of way, if it were so intended. 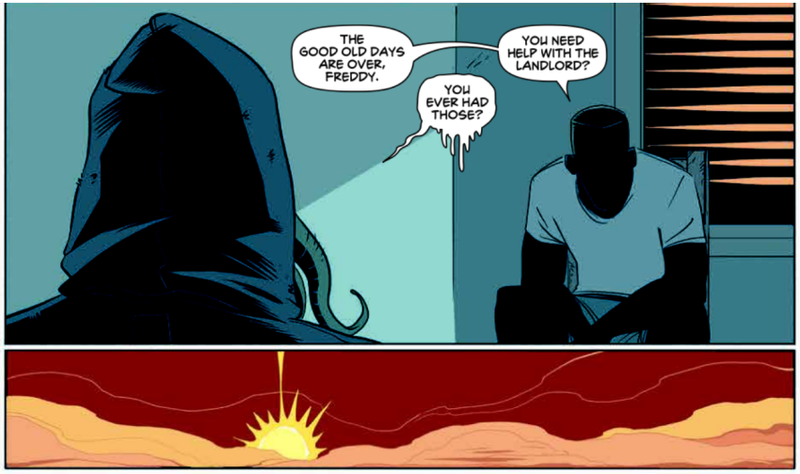 The second issue of Prez was a big improvement – much less scattered. 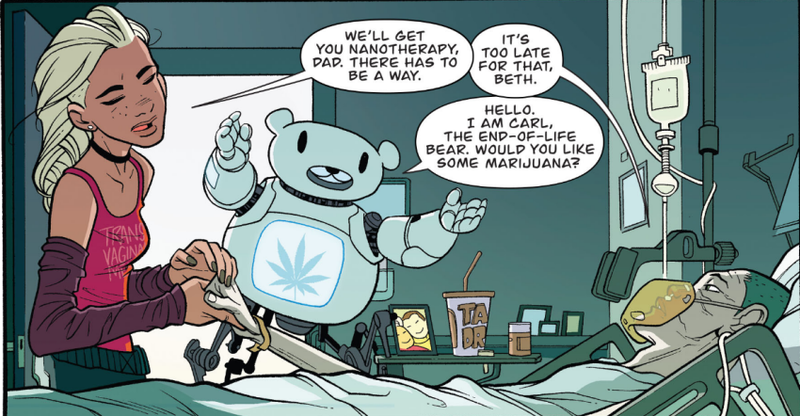 And Carl the End-Of-Life Bear made me smile more than anything I’ve seen in comics this month.